One more project… | In the Crayon Patch..
One of the big expenses of making quilts is the cost of fabric. I recently purchased 2 grab bags from Cherrywood Fabrics. This is the most wonderful fabric. 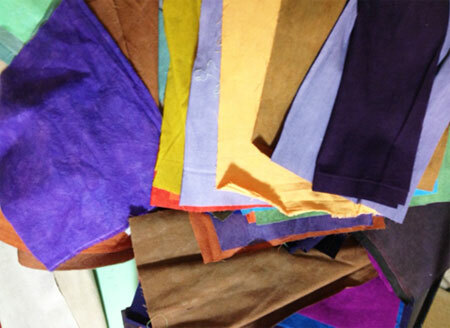 It looks and feels like suede, and comes in a huge range of colours. I wouldn’t be able to decide what colours to choose if I had to, so the grab bag saved me the agony of choosing, and was a lot cheaper than choosing 30 or more colours. This is what I got.. some of it, at least. Average size was 9″ x 7″. And here are a few of the blocks I have made so far. Not sure what the final design will be, but I am starting with half-square triangles. The final size of these blocks will be 3 inches, so I have a LOT more to make. 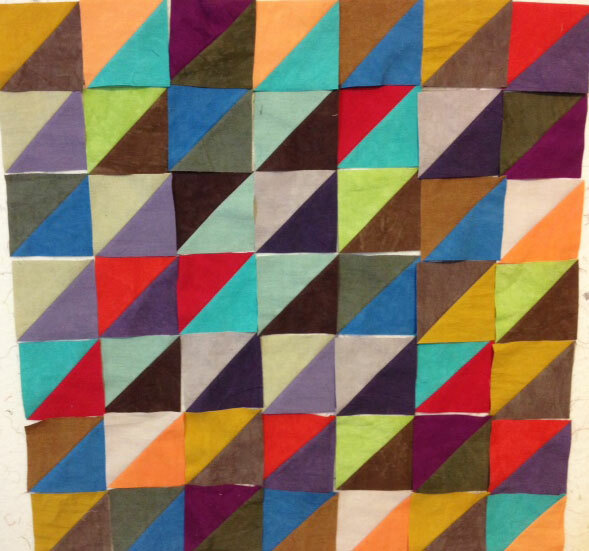 I am not sure what size quilt I will end up, but plan to use almost every scrap I have. I am very pleased with the way the colours work together so far. And here is the link to the Cherrywood Fabrics website. Also check out their modern section… Although the fabrics are available online, you can also find them in select quilt shops. Ta-da! The completed quilt, hanging on the side of the barn at Quilts at the Creek quilt show. So lovely, hope Chris and Barbara like it!